When this headlamp first appeared years back, it started off a small revolution in the history of torches. It was the first time a head lamp would last up till 180h, with it’s bright LEDs. It was the first time you must not worry if your head lamp is going to die on you while you’re still hiking in the dusk to reach point B.
I never would ever imagine that I would one day spend a small fortune on a head lamp. Afterall, the famous Maglites were there and they did performed pretty. It was just that they were not exactly made for mountaineering, and it seemed that the manufacterer’s target group were pointing only to normal civilians in the city, even though “Lara Croft” uses it in her movies ;-). Oh yes, they even brought out a head strap to go along with the torch. But this was not very comfortable, with it wiggling around the side of your head. And then it came to me that I needed an alternative for my outdoor trips. 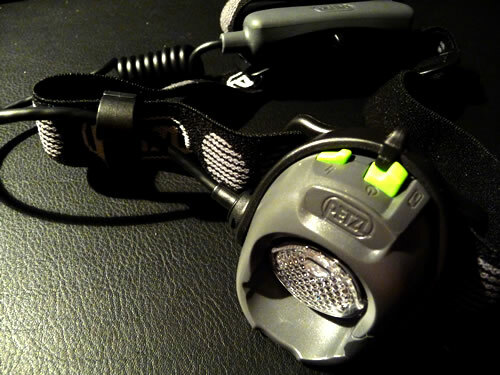 Petzl was not the first to introduce LED head lamps, but they definately were the first to produce the first head lamp that was handy for any outdoor activities, small, light, durable and strong. The Tikka model proved a favourite that is still a favourite till today. For my usage, the tikka would’ve actually been sufficient. But I wanted something better and stronger and discovered the bigger brother, the MYO XP model. It has 4 differant lighting performances and a boost function which points to your target at 97m. The battery life lasts at economic level up to 180 hours which is about 7.5 days non stop. You would discover that even after a 2 week outdoor trip with usage in the evenings for cooking and reading, the battery life would be still intact. The head lamp is used with 3 AAA batteries, is water resistant and comes with a head strap and an extra strap for usage with helmets. It has a wide and focused beam, it tiltable and has a battery life indicator. Petzl gives you a 3 year garuantee, so if you do have problems with your lamp, contact your local Petzl dealer. Priced at 72€, it isn’t a cheap thing to invest in.The MYO RXP is a similiar model which is programmable and costs 7€ more. But with this product you can be sure that it will be a good mountain companion that lights up your way for a long time. We have been using this lamp for almost 6 years now, and yes we are satisfied! Thank you Petzl for lighting up our nights!